I am not a morning person. Nor is my husband. 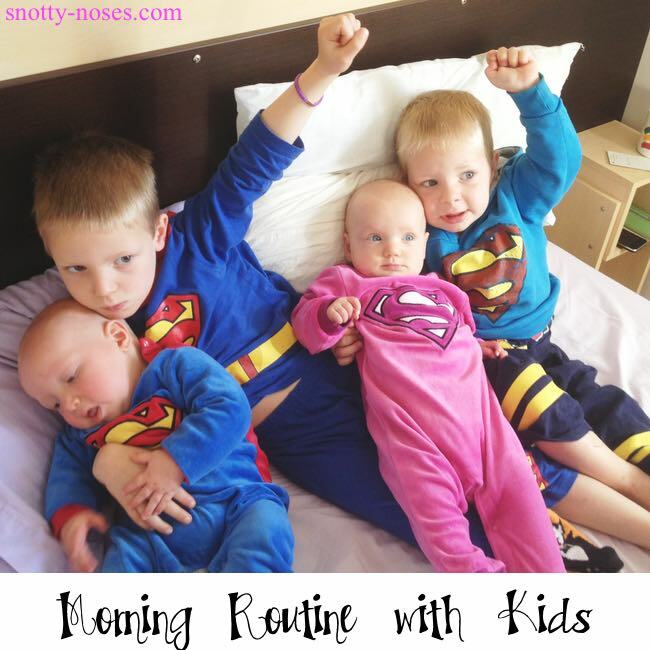 With four young kids, mornings are one of the toughest bits of parenting for me. 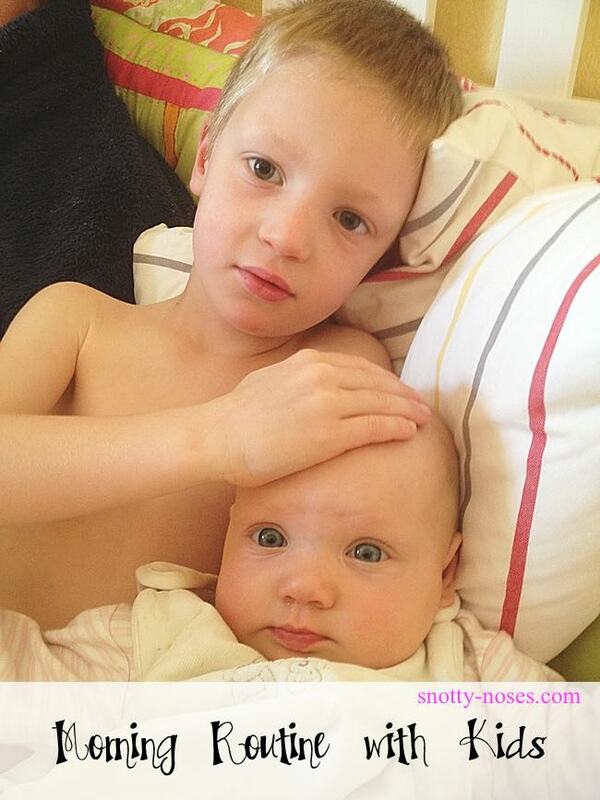 To make you feel better about your morning routine, I thought you might enjoy a glimpse at ours. Dream: kids wake up at 8. Plan: kids wake up at 7. Reality: Sebastian wakes up at 6.40. I bring him into bed for a cuddle and hope that he doesn't wake everyone else up. Signs of life from husband but still relatively moribund. At around 7, a sleepy pat pat pat of feet and Galen lands on my bed, shortly followed by another pat pat pat which is Dante. Quietness continues for approximately 20 seconds whilst they rub their eyes and then it's like someone pressed the ‘ON’ button. Suddenly the bed has come alive. There is an 8 limbed monster flailing around. The monster keeps squawking and steeling the duvet covers. I invite the boys to play in their room. They decline. Galen tells me that Dante's hands smell of poo. "Dante have you been playing with your bottom?" I ask. Galen changes his mind and thinks it's his hands that smell of poo. "Galen, have you been playing with your bottom?" "No, Dante has,” he replies. I try not to laugh and tell him to go and wash them. At 8, we all make it downstairs for breakfast which today passed relatively uneventfully. I go upstairs to shower and take Galen and Celeste with me. Galen is playing with a superman figure and despite me putting his clothes in his hands, they don't appear to be actually on his limbs. I tell him to get dressed about 5 times and then threaten to take away superman. He manages to get his pants on his head. I get in and out of the shower. I hear a 'shuffle shuffle shuffle' as one of the babies crawls into my room. They look like little clockwork dolls as their bottoms wiggle from side to side. It's Sebastian 'bbbb' he says. I pack school bags. A bottle of water in each and a healthy snack. 8.45 and I go upstairs again to assist shoe putting on to find that their relatively tidy bedroom seems to be less than tidy. "Look mummy, we've made a boat" says Dante. There are blankets, pillows, teddies, toys all dumped in the middle of the floor. We quickly put everything away. Galen starts helping. Dante says he's going to put himself in the basket and runs off with an IKEA basket on his head. Galen howls with laughter. I can hear Sebastian crying. "Dante, take the basket off Sebastian's head". Dante runs away again. I put Dante on the time out step in an attempt to teach him that putting baskets on your baby brother’s head isn’t great. “Dante, you're on the time out step because you tipped everything on the floor and when I told you to help tidy it up you ran off with a basket on your head and then you refused to take the basket of Sebastian's head when he was crying." Even as I'm saying it, I'm trying not to laugh. He looks up at me with big blue eyes, like the cat in Shrek. "Sowwy" he says with a cheeky grin on his face.